In SDI community, we have a lot of organisations who are doing a great job and have poured tremendous amounts of effort into making their SDI as good as possible. We thought that recognizing this success would be a great way to celebrate those who deserve it. “I always thought we should find new ways to use the huge amount of information we gathered everyday (over 15 million requests are sent daily to spatial web services out there and respective availability and response times are recorded by Spatineo) and turn into something we could use to recognize those who outstand in performance according to our measurements. As we started to collect all these data 5 years ago, both the algorithm and the services we have discovered can produce a consistent basis to turn the availability information we have recorded in our database into a criteria for something useful, interesting and valuable to the GIS community. This is how the Spatineo Quality Award was born. Measuring your status is immensely important in order to progress towards your goals. Setting the bar high can be sometimes hard, but the feeling when you finally reach that goal you have been working towards for a long time is really rewarding. We think that those who have made that journey and reached their goals and acquired great level of succession should be held as an example to other. What could be a better way to recognizing success than highlighting and rewarding? That is exactly what Spatineo Quality Awards are about. Showing inspiring success stories might just be the tipping point for others to grasp for that success themselves. We at Spatineo aim towards helping our customers to set their goals, reach their goals, and progress even beyond their goals. Geospatial community isn’t just build from different individual pieces; we work interconnected and together. Even if just few organisations take the steps to reach higher, we all benefit from that. Learning together and helping each other with recognizing success is the way to go. Vodohospodárska výstavba was announced as one of the winners at Spatineo Quality Awards in INSPIRE 2017 Conference. Next Spatineo Quality awards coming soon! The next Spatineo Quality Awards will be given at GIS Expo in Helsinki. This time we are finding those Finnish organisations who have succeeded with their spatial data infrastructures! We’re eager to see if there any outstanding performances or extraordinary level of excellence. Hope so. 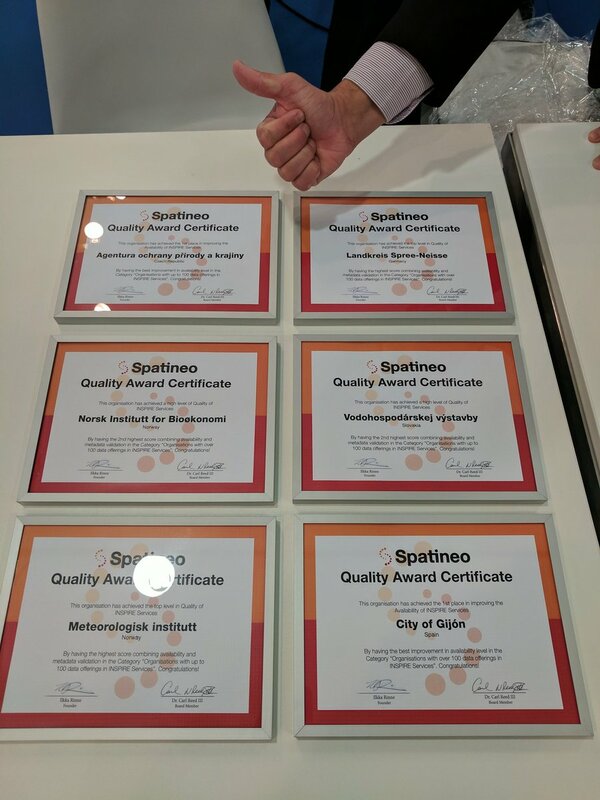 More info coming soon about Spatineo Quality Awards at GIS Expo, stay tuned!